We now know how to teach entrepreneurs how to think about business models and use customer development to turn hypotheses into facts. But there is no process to teach how to get an epiphany. We can only try to create the conditions where this might occur. Luis, one of the CEO’s from our first National Science Foundation class, came in to speak to our next class. We had a couple of minutes to catch up between sessions and the conversation got strangely awkward when I asked him how their startup was going. The Customer Development process was a result of an Epiphany I had when writing my memoirs. After 80 pages, I realized in one instant that the stories I had been recounting weren’t of interest (at least to anyone besides me), but the pattern behind the stories had much deeper meaning. Years later, the key ideas in the Startup Owners Manual came to me in the same way – realizing that startups are a search for a Business Model, and that the Business Model Canvas was the organizing principle for Customer Development. All of these insights came fully formed. 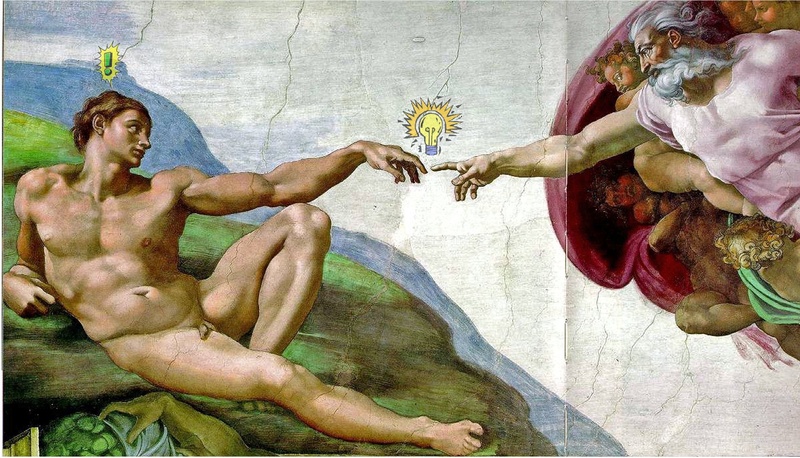 While we can describe an epiphany, we don’t know how to teach it or make it happen. But we do know how to set up the conditions for it to occur. First interact with lots of people — the more they are different from you with different ideas, and different perspectives the better. (Getting out of the building in the Customer Development process guarantees you’ll do just that.) Next, attack whatever problem you’re working on head-on. In Customer Development that means building a set of business model hypotheses, and running customer discovery to test those hypotheses. Most of the time you’ll be slogging through a ton of data operating in chaos trying to figure out what direction to take your company. Here’s the part that’s counterintuitive – on a regular basis make time to take an hour, or even a day to do something completely different. Go for a hike or a drive. Walk around the city. Don’t distract yourself with something that makes you focus (the movies, TV, email or the net.) Instead, shut it all down and do something that’s relaxing and gives the problem solving part of your brain a rest – let the pattern recognition side take over. It can be challenging for an entrepreneur to slow down, disengage from the relentless pace and smell the roses. But making this kind of time for your right brain to process what your left-brain has learned can bring you insights you’d never uncover otherwise. You can’t force an epiphany but when it comes, you’ll know it. You’ll be blinded by the light. Steve, thanks for sharing such great experience, where combination of focus on searching the business models should embrace those moments of letting the brain observe and process by giving the chance. Tom Kelley from IDEO said on a brazilian magazine some time ago: “we hire people form ‘T’ skill, not ‘I’ skill. T means that the person can be an engineer, but also like doing art painting, movies…” on such shower moments those insights for sure will come. By the way, the book Startup arrived yesterday at home in Brazil. Now time to read it, practice it, teach with my students, take some shower,movie…. Steve, I think you are exactly right. The disengagement of the layer of conscious thought (our analytical brain) is a key. I recommend creating a daily structured space to allow connections to “bubble up” on a daily basis. Deliberately delaying your wake up – the last 10 minutes before you fully wake up are very good. Practicing an art form (piano works for me). Each of these activities has within it a marked absence of the sense of “I”, your identity. The fact that you are aware, but not greatly occupied by the sense of self provides an opportunity to for messages and connections from your sub-conscious to reach you conscious, grasping mind. I have white boards all around my home so that when I get little (or big) connections of this type, I can immediately write them down. Part of the structure of this type of realization is that they often emerge weakly encoded in short term memory so you may have have less than 60 seconds to get them written down or you risk losing them entirely. At this point I have multiple whiteboards around my home, each with dozens of notes and diagrams from this type of exercise- at least 80% of which become part of my business or teaching or blogging. It is a “core competency”. Daily small realizations (in addition to the big ones) can be pivotal in business development. BTW – We met at SXSWi, and I shared a copy of my book “Startup: An Insider’s Guide to Launching and Running a Business” with you. Hope you had a chance to check it out. As always very well written. A slight correction. 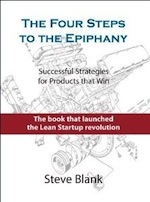 “…An epiphany is a different way of solving problems than the problem solving we do every day. I think ephiphany is the outcome and not the process. He says he’s immediately “executing” on that epiphany. To me that sounds like he’s not turning that new Canvas into hypotheses to test. Am I mis-interpreting? I’m calling such a moments – ‘the puzzle is now complete!’. Actually this is a result of creative process. Sometimes it overwhelming. And yes, you can make it happen a little bit often check “Conceptual Blockbusting: A Guide To Better Ideas” by James L. Adams. Hi Steve. I found your site and I ordered your book. Thanks for sharing all valuable content. Looking forward to read your Start-up manual and follow new topics on your blog. Great post Steve. I guess every individual gets an epiphany at some point of time, but what’s important is not to talk yourself out of it and believe in it. Exceptional post. Took my breath away… really. The ‘epiphany’ is a very well established problem in science — mostly in physics (Schroedinger, Heisenburg), but also a bit in biology (Darwin). The single critical condition for an ‘epiphany’ is total commitment to a problem that cannot be solved and cannot be ‘redefined’. You have to look at data, see your vision, and then figure things out. It is actually a very painful process, as I am sure you experienced. Epiphanies aren’t cheap or easy. So, to your Epiphany followers, I would say that if you do not think about your problem all the time (really. all the time), then you might as well read a management book. Did Bill Gates have an Epiphany? Did Mark Zuckerberg? Likely. Total immersion and visceral commitment to the problem is, in my humble opinion, the path to epiphany. Great advice. If only everyone tapped into counterintuitive moments the world would be a better place. The obstacle comes when someone gets stuck celebrating their epiphany, rather than getting down to the hard work needed to bring it to fruition. Hi Steve, can’t teach eh? Obviously this depends on your definition of teaching and I prefer creating learning environments, so we are probably not too far apart? I always find it interesting what is overlooked. If you cannot teach, or shall we say prepare students for this, then why do design courses exist that claim to do just that (once you get beneath the surface)? my colleagues will also claim to do exactly that, 30 of them have just done so in a staff development session. Let’s work on a premise, see opportunity recognition as a subset of innovation (arguable)’ see innovation as a subset of creativity too? Now let’s consider how occupational therapists who work with brain injuries help patients to become ‘active thinkers’ again, even if this means teaching someone to use a knife and fork again as if it were the first time. They rely on cognitive pattern development, what we may call gestalt theory. They ask questions of patients such as how how many alternative ideas do they have on a subject? How disparate are the neural connections being formed? How connectable and arguable are these – through reflective process and articulation. Now tell me that this isn’t a form of teaching creativity! The diagonal thinking test designed to evaluate the capacity of what is commonly termed left brain and right brain thinking is a concrete example of what the advertising industry uses to evaluate applied creative capacity. I therefore beg to differ my friend. Here is the new Uk guidance that is currently out for consultation that I mentioned above. This looks beyond the business school environment and was announced as ‘a new kind of learning’. It’s very much a UK perspective with UK definitions, but I wonder what you and colleagues might make of it in the US? “iconoclast” by Gregory Berns. 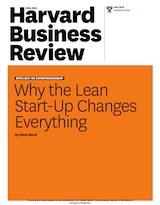 ” a neuroscientist reveals ‘how to think differently’ ” Harvard Business Press. As an iconoclast, I’ve struggled to explain epiphonies (that perceptual ‘image’ that when decoded provides a new insight). Highly recommended to you and the Lean Launchers for the most recent ten years of neuroscientific study of how the brain processes; and how iconoclastic tendencies can be nutured. For those of you interested in this ( and you should) the book “Think and Grow Rich” talks about “infinite intelligence”. The book might have a cheesy title, however it took 25 years to interview billionaires 70 years ago and was sponsored by Andrew Carnegie and build upon interviews with Rockefeller, Ford, Charles Schwabb, JP Morgan and 100s of others etc. The book cover a variety of topics and is like a formula. The thought principle describes how to allow these thoughts and cultivate them on a regular basis and have much more than a few in a lifetime. In music, you can make a strong distinction between the “genius” of Beethoven vs. the “brilliance” of Haydn — the former is much more popular because there’s a passion and romanticism to the music (and the composer’s persona) that you won’t get from the latter. But without Haydn, Beethoven wouldn’t exist — he laid the theoretical and structural frameworks that made the styles of the latter musicians possible. He’s the engineer of music, in other words. Haydn is not seen as being as “exciting” as Beethoven, but consider that he had lived a fairly good, stable, reputable life and was respected very widely by the masses during his era. Whereas Beethoven lived a fairly difficult life, going through a lot of ups and downs. Reminds me a bit about the Durant vs. Sloan presentation you did a while ago. In the overall sense, this is a good sign showing that the medium has gained a level of respectability and that people are becoming more and more interested in the activity as time goes on. The problem, however, is that this has the potential to turn entrepreneurship into a form of fashion, where people learn to pick up the “mannerisms” of a good artist then just talk, walk, and act in the manner that they learned from school. It’s happening already, with the “What Would Steve Jobs Do” style of management and whatnot. I’d be careful with how you set up your curriculum, because education does have the potential to compound these problems if it doesn’t attempt to mitigate bad ideas. I don’t have any hard-fast answers, but I do know a few things about how the creative process works. For one, even among entrepreneurs it’s important to figure out if the student is a Beethoven or a Haydn type — the former will create and follow their ideas in a fervor of irrational motivation, while the latter will be very methodological in how they approach their problems. They both have their respective strengths and weaknesses, but if you can harness both (in a co-founder type of relationship) then it can make for an unstoppable force. We all like to think of ourselves as unique snowflakes, but the vast vast majority of people will fall on either one side of the spectrum or the other. The other thing that’s important — and this has happened to me in research a lot of times — is the necessity to “overload” yourself with too much information and then sit on it for a while before achieving an “insight” of some sort. The human mind doesn’t like the cognitive dissonance that comes with “not understanding” things, so in a pinch, it will create ideas and narratives that revolve around the ideas that are stirring up in your head at the time. Epiphanies actually happen to people all the time, I think, it’s just that most of them aren’t worth talking about because their either too personal or non-consequential to make it a public matter. But the trick here is to have a lot of high-quality information that’s relevant to current day events, and the brain will naturally make those connections on their own. Lastly, there’s data, as talked about above, but there’s also a need for “frameworks” that allow you structure and direct those ideas in a coherent manner. Philosophy has a lot of those — pragmatism, existentialism, analytic, phenomenology, etc. This is pretty abstract stuff and it’s hard to get people interested in it, but without it it becomes difficult to articulate or focus incoming information in such a way that gives it direction. All of this is difficult stuff — you really need a lot of things going on for it to be even remotely successful. But we gotta start somewhere, I think. Thank you for a fantastic post! I have had a few epiphanies and I can now see the pattern in which they occur. I will be sharing this with my entire team. In my experience, downtime has provided the space for epiphanies to come to (or be recognized by) me. Like Luis, I’ve had several in my life. They’ve been pivotal, if you’ll forgive the phrase, in guiding my own ventures. I think it’s true that reflective/meditative times are best. But I’ll bet that for busy entrepreneurs at least 50% of “a-ha!” moments occur in the shower! Love that he had his epiphany in the shower. Maybe we should just tell entrepreneurs to take a shower! Ha! Epiphanies are interesting and also really scary. I think the scariest part is that you can work on something for 5 years, have completely no insight, and then “get it” while you are randomly doing something else. Its absolutely frightening. In my work with entrepreneurs we always focus on planning, planning, planning, but you are right that nothing can prep someone for the epiphany. In your experience, how do you help entrepreneurs evaluate their epiphany? Since I naturally have a tendency to theorize and strategize prior to action, I would be extremely nervous if one of our clients deviated from a plan to tackle something they figured out “in the shower”. Also, its possible that some epiphanies are not the right way to go just yet (or ever), how would you respond to that? How do you coach them through it? Re: last part on “doing something completely different”. I find it similar to “Stopping the world” and “Not-doing” as described in Carlos Castaneda’s “Journey to Ixtlan”. Also agree it should be as meaningful, as an epiphany that might follow as a result. Moving into the philosophical, I’d say teach from perspective of “How Big Will Your Epiphany Be?”. The more relaxed while focused you gain your data, the easier for the creative to analyze. Remember the Epiphany can be that “shining light”, or just a matter of realizing what is happening in real time in the real world and it is time to strike. What you call epiphany is also referred to as Strategic Intuition. At Columbia Business School (CBS) there is a class taught by Bill Duggan called Napoleon’s Glance. Definitely not a class in analytics, but explains and gives examples in history of these insights that you talk about. He actually has a book called Strategic Intuition on the topic. It was one of the top classes that I had in the program. Good talk at AOL yesterday evening, thanks! 1. Driving the boring segments from San Jose to Las Vegas or to Oregon. 2. Long distance bus travel in Mexico. 3. Riding trains in Europe with a Eurail Pass. 4. Prolonged people watching at Santana Row in San Jose and Las Vegas. These are the places that work for me and they always work to create epiphanies when I have a big business problem to solve. Other similar places haven’t. I’m a bit different than most entrepreneurs in that I’ve produced useful work in over 50 disciplines during the past 50 years and have a huge inventory of concepts from various industries to draw from. I post ideas on entrepreneurship on Google Plus if anyone cares to learn more. I hate to quote a tv show but this made me think of Mad Men’s, Don Draper in season 1 or 2. Great article and so true. It has happened to me any number of times in writing my first book about startups and helping others do the same. My epiphany was realizing, much like you Steve, that schools, colleges and universities are not preparing students for the workplace. They’re teaching the “craft of your business” (graphic art, writing, medicine, law, etc.) but not the “business of your craft,” how to make a living by yourself at your craft as a startup or working in a business. I rewrote the first part of my book because of this epiphany. Excellent post.. I am waiting for my epiphany moment. I just have a question for you. 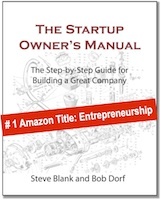 I have suscribed to your online course and I bought your book “The Startup Owner’s Manual”. I would like to know if you have some recomendation to read it and how integrated it with your blog. Thanks to Steve for sharing his epiphany about epiphanies. I did not think of it as an epiphany, but I have experienced what I call the ‘Eureka’ moment about some thinks I had been working on for long periods – such as my doctoral dissertation, a business idea, or the key theme for a story. I agree with 2 key elements that Steve had identified- good deal of data/information processing and freeing up the mind to recognize the big patterns. I tend to get insights while going on a long drive or when flying etc when I am not focused on any one task in particular. Steve’s column helped me realize that we dont have to sit around waiting for an epiphany- it just happens when the circumstances are right. All we can do is to encourage it by immersion in data and by allowing down time by doing diverse activities and being open to new ideas. “Do something completely different.” To me this acts on the same principle as when you’re trying to recall something but cannot in the moment. Later, you’re doing something random (like taking a shower!) and the answer comes to you out of nowhere. You might enjoy the new book “Imagine.” It teaches about how one might be able to encourage insights and epiphanies. The book came out recently. I’ve had several epiphanies as a result of smoking marijuana. You may think I’m joking, but I’m not. One of my epiphanies led me to create a site that has attracted over 30 million visitors over the last decade. I’m not saying marijuana will create epiphanies for everyone, probably just a minority, but I think this is worth mentioning because it has really been a great help to my thinking. I’d also recommend taking 30-40 min naps in the afternoon. They’re good for your brain and memory (see book ‘brain rules’), you feel awesome after a nap, and they give you this break from thinking that is so important. I really enjoyed the book “Brain Rules.” I enjoyed the parts which discussed how we learn and various ways we commit things to memory. I’m reading through “Imagine” again. It also discusses the needs to be relaxed to encourage insights. I suppose that’s why user “Rather Not Say” above said a drug helped with one of his insights. The book “Imagine” talks about other drugs and neither it nor I am condoning drugs to arrive at insights. Their negative side effects outweigh the good in most cases. Often, if the drug user does have an insight, he either doesn’t recognize it, or promptly forgets the insight. Great stuff Steve. Reminds me of a Stanford e-corner lecture from April 14, 2010 where John Seely Brown talks about shaping serendipity (serendipitious insights). Epiphany can be teached and have been so for 2500 years. You can find a 10 days course here. The single critical condition for an ‘epiphany’ is total commitment to a problem that cannot be solved and cannot be ‘redefined’. You have to look at data, see your vision, and then figure things out. It is actually a very painful process, as I am sure you experienced. Epiphanies aren’t cheap or easy.